Gogol Bordello turned the Showbox SoDo turned into a fist-pumping, sweat dripping, free-spirited gypsy punk dance hall to close out the first day of the inaugural City Arts Fest, a festival dreamt up, created and executed by Seattle’s City Arts Magazine. Except for a few ticketing/wristband issues it seemed to function smoothly. As with any first year festival, there will be growing pains. The staff was coordinated to expedite audience entry as quick as possible. The line was long when I arrived due to the uncertainty of the wristband entry. Many weren’t sure how many spots were reserved for wristband holders so they showed up early. I’m sure they’ll iron out these kinks in the future. 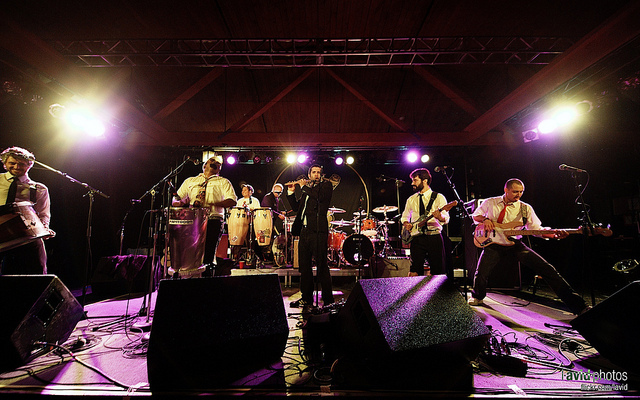 The opening band, Forro in the Dark, is a New York based collective of Brazilian expatriates. Their mission is to bring forro, the hip-swiveling, dance floor filling, rural party music of Brazil’s northeastern states to the masses. They’re a little long-winded on stage, turning many of their shorter three to four minute recorded versions of songs into ten to fifteen minute largely instrumental excursions. Jorge Continentino expertly rocked some mad flute solos that at times sounded like something you’d hear on a Jethro Tull record. Mauro Refosco impressively changed speed and tempos on the zabumba drum as if it was second nature. The musicianship was definitely there but the songs were stretched out a little too long. If they shorten and tighten the live versions up a bit I think that would help the audience retain more energy and interest. To close out their set they brought that crazy Gogol Bordello band leader Eugene Hutz out for one song. Boy did that fire the audience up and hint at the high energy set to come. Gogol Bordello came out blazing. Their unique brand of gypsy punk and their unrestrained energy got the crowd going right away. The bodies in the mosh pit, with their arms flailing, waving and pushing, ended up going forwards, backwards, sideways and slantways. Inner gypsies came out of the woodwork and let their freak flag fly as dancing groups and circles formed in the beer garden, upstairs bar, near the entryway and anywhere else one could find a few inches of open space. An older woman danced off to the side like no one was watching and Gogol Bordello completed the atmosphere with their sing along style vocals and raucous Eastern European influenced jams. Gogol Bordello stuck largely to material from their excellent new release, Trans-Continental Hustle, sneaking in a couple older gems along the way. “Immigraniada (We Comin’ Rougher)” and “Pala Tute” were a couple of highlights and both featured spirited sing-alongs even though I’m guessing the majority of the crowd, including myself, didn’t understand all of the words. 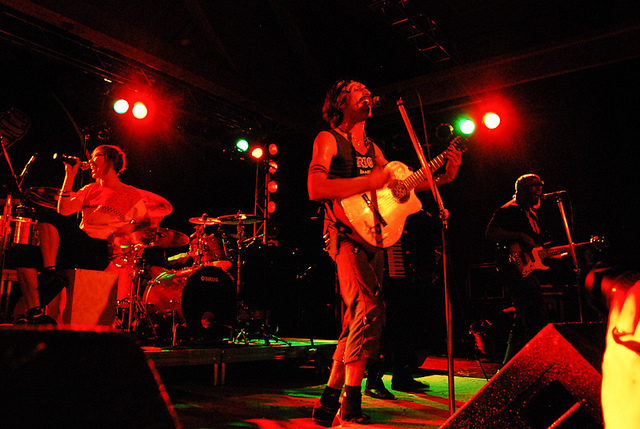 Gogol Bordello does a great job of showcasing diverse culture and different ethnicities. They sing in multiple languages including English, Ukrainian and Spanish, sometimes within the same song. Their slower, softer side was showcased on the exceptional “When Universes Collide” starting with Hutz on acoustic guitar and Yuri Lemeshev on accordion. Other highlights included the Hebrew-folk of “Start Wearing Purple,” a song whose rhythm would be right at home at any bar mitzvah. They sped “Wonderlust King” up a little from its already frantic pace, whipping the crowd into a frenzy in the process. “Trans-Continental Hustle” falls somewhere in between Paul Simon’s “Me and Julio Down By the Schoolyard” and a gypsy rave-up. Gogol Bordello put their all into it and left the audience wanting more, even after the third encore! I was also fortunate enough to attend the City Arts Fest kick off party. It included the first look at Seattle 100: Portrait of a City, a project by photographer, filmmaker and social artist Chase Jarvis. Jarvis took portraits of 100 tastemakers, trendsetters and innovators in Seattle. The subjects included Nancy Pearl and Sherman Alexie from the literary world, Vince Mira, The Blue Scholars and The Saturday Knights to represent Seattle music and 95 More. They also served great hors d’oeuvres and free drinks. My advice, if you can afford it, is to buy a VIP wristband to City Arts Fest. Not only do you get guaranteed entry into every “main stage” show, you also get an invite to the Kick Off Party! Last revised by: Dagmar, our reviewer, on 11/08/2010. 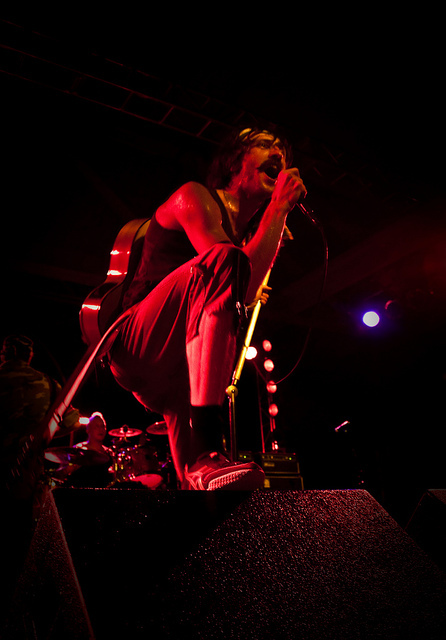 This entry was tagged Chris Senn, city arts fest, forro in the dark, gogol bordello, Show Reviews, Showbox Sodo. Bookmark the permalink.